According to a new report from Samsung's home country of South Korea, the company's upcoming Galaxy S7 will be offered in two sizes. Note that this rumor is a bit on the wild side, meaning that you might want to have a grain of salt in your proximity just in case. If the source of this report is to be believed, the standard version of the Samsung Galaxy S7 will come with a 5.2-inch display, but Samsung is also said to launch a 5.8-inch version of the Galaxy S7. Although this seems like a long stretch, bear in mind that Samsung's current-gen smartphone line-up includes two smartphones that are almost identical in terms of design and specs, with the only differentiating factor being the display size. We're obviously talking about the Samsung Galaxy S6 edge and the Samsung Galaxy S6 edge+. The report also notes that the Galaxy S7 will come with a 4K display, but the source does not mention if this will be the resolution of the 5.8-inch display, or for the 5.2-inch version as well. The Samsung Galaxy S6 already comes with an amazingly sharp 5.1-inch display with a resolution of 1440 by 2560 pixels (QHD) at a PPI of 577, and going any further than QHD at 5.2 inches across the diagonal might be considered a bit of overkill. Note that the Sony Xperia Z5 Premium, the world's first smartphone with a 4K display comes with a 5.5-inch panel running a 4K resolution at 808 PPI. Allegedly, the Galaxy S7 will come with 4GB of RAM, which would mean that Samsung's newfound capabilities of fitting 6GB of RAM inside a smartphone will be postponed until the Galaxy Note 6 rears its head. The oddball information provided by the report is that both Samsung Galaxy S7 versions will be released by the end of 2015. This obviously seems very unlikely, although it should be noted that previous reports claimed that the manufacturer aims to have the Galaxy S7 ready by the end of the year, which could be the source of any potential confusion. Please no 4k resolution. QHD is more than enough. Yep! Stupid marketing teams. QHD is more than anything anyone would ever need on a 5-inch display. And you would say otherwise is Samsung make a 4K one. Typical Samsung fanboy. Nope, unlike your fangirls I don't like wasting resources on useless stuffs. That's I said even QHD **is more than anything** one needs. FHD is good enough for 99% of people. I have barely seen anyone saying they could notice individual pizels even on a FHD display. On a QHD it's even tougher. Learn to read first before commenting with your useless brain. "if"(sorry i made a typo) Samsung make a 4K one, would you still call it a stupid marketing? Yes, why not? Who on right mind can justify a 4K display on a 5inch display?? I am more than happy with a FHD display on mobile. The argument of VR is redundant currently. How many VR sets sell? And if that's required, better create a seperate phone to use for VR. Sorry for misjudging you. But you should keep your words, dude. Keeping my word?? Companies don't run according to my wish. If they left it to me, I would have 3500mAh battery in every phone and with a 1/2-inch sensor, FHD Super AMOLED display and Exynos 7420. I don't worry about microSD,but no harm if we have that as well. Unfortunately I don't control any of them. So, I use whatever they make! Full HD Super Amoled not that good 2K Super Amoled a lot better especially with white point. You didn't misjudge him. He is die hard Samsung fan. If you remember the way rd_nest and this so called "unbiased" TyrionLannister dude's commented and behave during the S6 launch event then it will become crystal clear that both are s-heep. I clearly remember rd_nest said Antutu benchmark are crap because that time S6 didn't score the highest mark but after S6 broked the antutu record you forgot to mention that antutu is a crap benchmark. He is super butthurt about Sony releasing the first 4K display. Antutu benchmark is always crap. It was crap then, it is crap now. You don't have to look in past. I will say it even now. There is a reason why Anandtech never uses that, just talk to Andreilux if you have any doubt. But I doubt if you even have a clue who Andrei is, so pointless talking to a 'Kumar'. BTW, I make a living by benchmarking and analyzing enterprise devices. Be it storage, networking or hypervisors. I deal with benchmarking critical data center solutions everyday in my job. So, I do have a fair idea which benchmark is useful, and what is crap. If I say you don't measure latency in a backup/archive profile, I doubt it makes any sense to you. So, next time when debate with me about benchmark, get your basics done properly. Exactly, this Kumar doesnt have a clue what he is talking about just hurt about everything that Apple doesnt release lol. Antutu benchmark is a piece of trash benchmark everyone knows that. But you conveniently forgot to tell people or should I say you never bother to mention that AFTER S6 scored record high score. But I continuously told people that when Samsung failed to a achieve highest score. This is the same thing, you and "unbiased" Tyrion would have said nothing if Samsung release the first 4K display. They wont do 4k the battery life on S6 is bad enough with 2k screen. 4K would kill it. The battery life is pretty good for me. I get 5 to 5.5 hours screen on time on 5.1.1 and battery on 5.0.2 was even better. Also it did pretty great on PA, GSMArena's and anandtech's professional battery tests. Don't believe everything you read on the internet from haters. I get 4,5h onscreen time on S4 mostly browsing. Only 5h on S6? My usage is heavier. On similar usage, I got about 3 hour SoT on S4. If I browse, I can go 8-9 hours SoT easily. Maybe even more. Browsing is a much lighter activity compared to playing games that constantly sync with the server. If I watch videos, I can go higher than 10 hours SoT. Also, there is an issue. Clash of clans doesn't work on my university's WiFi. So I have to use a VPN application which drains even more battery. You've got s6 or s6 edge? 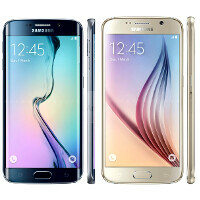 I'm considering getting s6 edge this year. Probably a 128GB variant. S6. But both have pretty similar battery life. Yeah, but 1080p would be less sharp compared to the QHD in S6. That isn't good. What's wrong with QHD. It's way more than you need for sharpness. It's even overkill for majority of the population. Why go with 4k then. What is there to laugh about? You think even an eagle could recognize individual pixels in a 500PPI display? A 500PPI display is same as 1000PPI display for humans. Z5 only plays media at 4K. rest all is stll fhd. Its really important to these guys who comes out with what first. These what they call "innovations" give them cred as they are the ones who released them first. Kinda gives them notoriety. First waterproof smartphone First 41MP camera First to have heart rate monitor First retina phone First game centric phone First edge screen First to go out in space First long lasting battery Guess what belongs to each OEMs? Ha ha ha. I'm super glad that other android company beat Samsung in their own game. Look at their butthurt fans. These guys were always vocal about how Higher resolution is better during the S6 launch after the Z5 premium the are saying the opposite. I'm 100% sure they would have said the opposite if Samsung released note 5 with 4K screen.